Sgt. 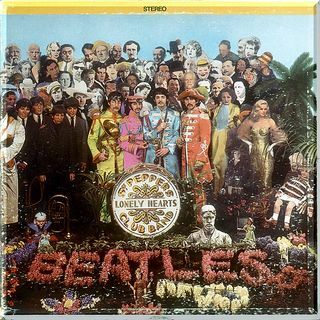 Pepper's Lonely Hearts Club Band is the eighth studio album by English rock band the Beatles. Released on 26 May 1967 in the United Kingdom [nb 1] and 2 June 1967 in the United States, it spent 27 weeks at number one on the UK Albums Chart and 15 weeks at number one in the US. It was lauded by critics for its innovations in production, songwriting and graphic design, for bridging a cultural divide between popular ... See More music and high art, and for providing a musical representation of its generation and the contemporary counterculture. It won four Grammy Awards in 1968, including Album of the Year, the first rock LP to receive this honour.